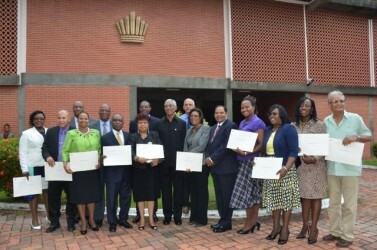 President David A Granger this afternoon (20 May 2015) at the Presidential Complex ( renamed Ministry of the Presidency), swore in several Members of the Cabinet of the APNU+AFC government. The election is over. Now is the time for unifying the country and for good governance. I do not know what criteria, (other than rewarding the leaders of the coalition) was used but I will accept that President Grainger has consulted and made his choices. This is, as it must be, and hopefully the regions and the ethnicities especially, will not feel left out. Guyana needs to move on from Appan Jhaat of 1957…. to what Prime Minister Modi of India ( a huge country with regions and ethnicities…linguistic/religious), says is his philosophy of government, ” Sabka Saath; Sabka Vikas”…..” Progress with all; Progress to all”. Good luck, Mr. President. Good luck Guyana. Yes,the national accretion council of Guyana is biased they are taking money for Registration. They are not functioning for Guyana’s students to have the best education. The following is an article I had published recently. I am hoping it would catch the eyes of respective Ministries and readers, in order to generate further constructive comments. Thank you.CAN GEORGETOWN EVER BE FLOOD-FREE? President David Grainger may not have been around, or may have been too young to recall what Georgetown really looked like around 1945 – 1950, but there are some senior citizens, still alive, who probably can. Georgetown’s eastern boundary ended at Alexander Village, with Ruimveldt, being canefields, on the south and east of it. La Penitence and Albouystown on the north, extended as far as the western end of Le Repentir Cemetery. Canefields continued east. The Cemetery ended about a hundred meters east of Cemetery Road, and swampy bush, which was the beginnings of D’Urban Backlands continued east and north, in back of the Botanical Gardens and Lodge. Newtown, Kitty or New Kitty was plotted out south of the Lamaha trench, with Vlissingen Road being its western boundary, and would continue, eventually, to the Botanical Gardens. The picture being painted here is a city, Georgetown that was much smaller than what it is today. Georgetown also had a much smaller population, but it had more trenches. As the population increased, trenches were filled in to create open spaces, roads and some building units. It must be noted that trenches in Georgetown, performed two functions; one, it collected used water from the human population and rainfall, which following a natural gradient, was drained into the Demerara River, and two, it acted as a reservoir to store water, until the tide flowed out, and caused water to empty out of the trenches, which was being regulated by flood gates called kokers. The volume of water pouring out of the kokers would be relatively constant. If there is more water to be drained in the given length of time low tide afforded, that water will remain in the trenches. In this manner, there was always some level of water in the trenches, since the population would still be dumping used water into the drains, which flowed into the trenches. Georgetown is some two meters below sea level, and water does not flow upwards, the system depended, until recently, to some extent, on the movement of the tides. This system always caused some level of flooding in the city. This flooding was relatively insignificant, with swollen drains and alleyways and some yards, rarely any roads, water did not stick around past one day, most of the time. This temporary flooding was usually a minor inconvenience. As the population grew, over the years, in Georgetown, it became evident that the trenches were unable to meet a quantity of water that now had far exceeded its reservoir limits. If we include negligent maintenance of the drainage system, a propensity for people to discard their ever increasing amount of trash and garbage in to the drains and trenches, and the decreasing amount of trenches, we have the formula for systematic and prolonged flooding, which presented very serious consequences during the peak seasonal rainfall. Flooding had now reached epic proportions. The question that should be asked is, not how to reduce flooding in Georgetown, but how to permanently eliminate flooding, period? Pumping out flood waters at a higher rate may work but the cost would very well be prohibitive, with a high maintenance value attached to it. It seems increasing the storage capacity of the trenches would be a permanent solution with the added perks of making it a profitable enterprise. –	These ten canals at approximately 1500 meters long would create a continuous reservoir of approx. 1.5 million cubic meters of water. –	_ Soil removed from the canals could be used to raise street and ground level. –	Clay bricks, which have proven their lasting ability since Romans times, can be used to make three feet thick walls and floor. This would drastically reduce the cost of construction. An army corps of engineers with 3000 workers, mostly of whom are minimum wage employees, should be considered. The potentials here are enormous, but I will leave it up to the readers to offer comments. Albert R. Cumberbatch, Ph. D.
In fourth standard (please do not ask which year), under the imaginative tutelage of Mr. Straughn, we learnt that Georgetown was bounded on the north by the Atlantic ocean; on the west by the Demerara river; on the south by the punt trench dam; and on the west by Vlissengen road. Indeed the area of the city has been increased over the years. A rather significant feature of climatic events is the “Hundred year ……” rainstorm / flood / snowstorm etc. It acknowledges that occasionally, there will be the flood against which it will be impractical to maintain – for the other ninety nine years – adequate defences. One inch of rainfall over an acre of land will precipitate 27,154 gallons [US] of water. 15000000 Cubic Meters = 3962580780 US Fluid Gallons. This is the amount of water from 145929.91 (say 146000) acre inches. The link shows rainfall distribution which is such that for many months in the year massive drainage infrastructures will be under utilized. GUYSUCO designed for draining one inch of rainfall in 24 hr. For urban areas, the drainage capability would have to be greater; but there will be some flooding in Georgetown during the months of May and June. Because, even with all other features functioning well, there will be rainfall (on the land side) coinciding with high tide (on the river / ocean side) when the kokers cannot be opened. The condition is aggravated during neap tides when the window for opening the kokers can be quite small. (The training of Mr. Jimmy Singh is gratefully acknowledged). Yes … of course you could put links to any items we have on Guyanese Online. Please update the ministers of each sector, so I can help my child with her homework. I will do my best to check the links to ensure that they work in the future.